Nu Vibe were contestants on X Factor 2011, They were voted off in week 2. 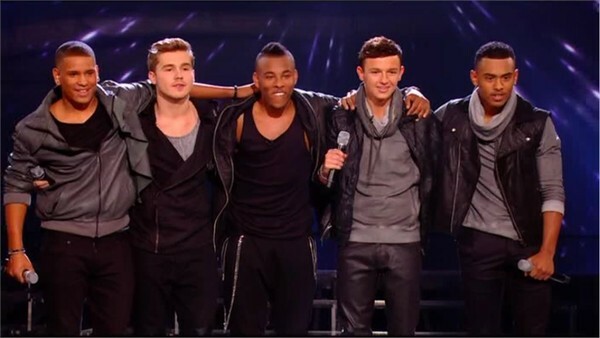 Richard, Stefan, Bradley, Jordan and Ashford all entered The X Factor this year as solo artists. They were given a second chance at the final stage of Bootcamp when the judges decided to put them into a group and Nu Vibe was formed. Richard started singing in a choir and realised he had a talent. Since his first audition he’s been taking vocal and dance lessons to boost his confidence. Stefan loves music and singing. He learnt to play the guitar aged 12 and then six months ago decided to learn the piano so played at home for 48 hours straight until he knew how to play four songs. Bradley started singing seriously six months ago after his dad heard him sing and decided to get him singing lessons for Christmas. Jordan only realised he was good at singing 18 months ago and since then he has done a few concerts and sung in school assemblies. Until The X Factor his biggest audience was 600 people. Nu Vibe were voted off in week two, losing the sing-off to Frankie Cocozza. Gary, Kelly and Louis all send Nu Vibe home.